Today’s Customer Service 1.0 applications are enterprise centric with the key business processes of sales force and customer relationship management being optimized – for the enterprise – through improvements in CRM and Call Center applications. These Customer Service 1.0 solutions are typically one-way information flows and enterprise-centric. 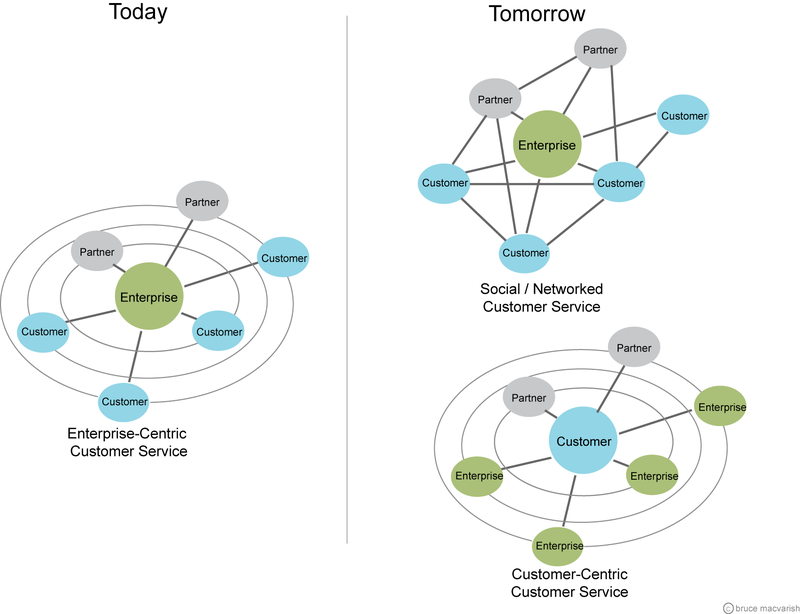 In today’s customer service world, the enterprise is the hub and customers orbit the enterprise with little interaction with each other and no collective intelligence derived from the community of similar customers. As Doc Searls has outlined, we could think of all markets being comprised of transactions, relationships and conversations. In Customer Service 1.0, the enterprise collects the transaction, relationship and conversation data created during the customer-to-enterprise interaction(s). The enterprise does this for each customer, then aggregates and optimizes their enterprise business processes based on this customer driven market data. Looking forward, tomorrow’s Customer Service 2.0 applications create value from the community of customers, partners and enterprise(s). It will offer end-user centric, Vendor-Relationship-Management (VRM) tools that integrate with key enterprise business processes and resources that are being optimized – for customers, enterprises and partners – through social software and networked data improvements in VRM, CRM and Contact Center applications. In Customer Service 2.0 solutions, the transaction, relationship and conversation data created throughout the customer-to-enterprise (customer-to-customer, customer-to-partner etc…) life cycle is captured and indexed in a way that makes it shareable, re-useable and valuable to the customer, the enterprise and the broader community of networked participants. As Customer Service 2.0 and VRM solutions emerge, we should expect to see a shift in the balance of power and control between the enterprise software industry, the customer service industry and consumers.